Best MP4 video converter which offers high output image and sound quality! 4Video MP4 Converter is the professional MP4 video converting software which can help you convert any frequently-used video file to MP4 with high quality and fast speed. It can easily convert MOV to MP4, change MKV to MP4, convert MP4 to MP3, turn MP4 into AVI and so on. Moreover, many powerful editing functions are designed in this video converter. It enables you to trim video, crop video, merge video clips, adjust image and sound effects, add personal watermark, add 3D effects and more. 4Video MP4 Converter has the capability to convert almost all video formats like TS, MTS, M2TS, MXF, MOD, AVI, WMV, YouTube FLV, DivX, Xvid, M4V, MKV, MOV to MP4. In addition, it can extract audio tract from video and convert it to your preferred audio format like MP3, ALAC, AAC, M4A, FLAC, etc. In order to improve the conversion efficiency, it is equipped with batch conversion function and the latest acceleration technology. •Convert AVI/MKV/FLV/MOV to MP4 and convert other common SD/HD formats to MP4 with exactly the original video quality. •The video to MP4 conversion will complete in an amazingly short time without any quality loss. •Besides converting MOV or AVI to MP4, this video converter also enables you to convert MP4 to other video or audio formats you need. With it, you can easily convert MP4 to MOV, MKV, AVI, YouTube FLV and more. •Extract audio tracks from videos and convert them to other audio formats just as you like. For instance, convert MP4 to MP3. •Support any popular audio format like MP3, ALAC, AAC, M4A, FLAC and more. •Adjust video encoder, frame rate, resolution, aspect ratio and bitrate according to your need. •Set audio encoder, sample rate, channels and bitrate. 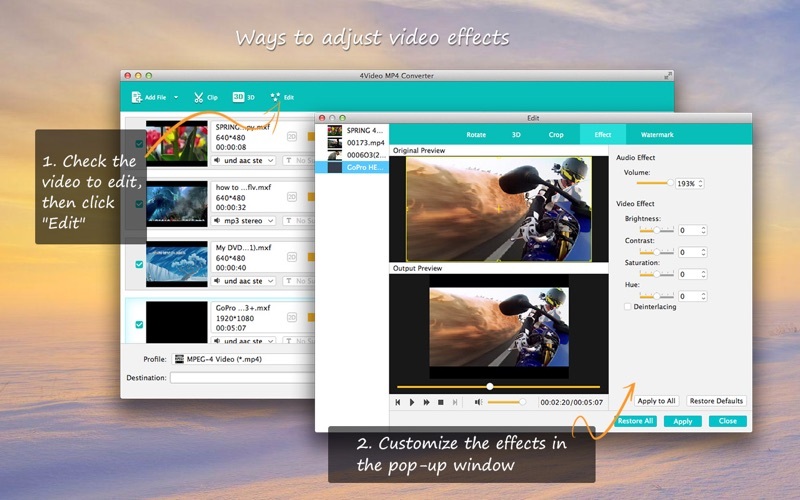 •Cut off any time-length video clips from the source video. 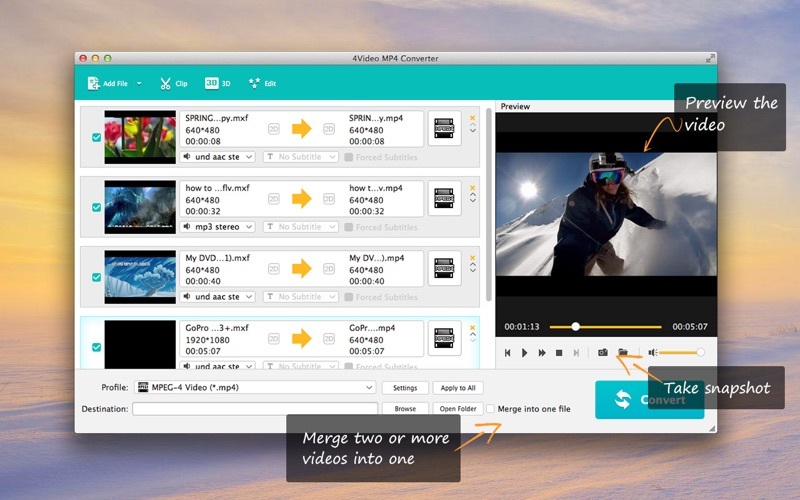 •Merge two or more video clips into one new complete video. 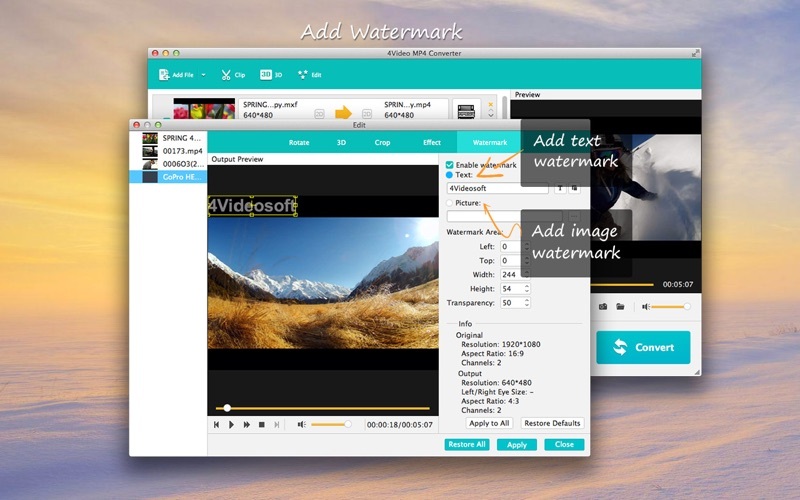 •Add personal text or image watermark to the output video. •Playback on multiple devices and players like iPhone X/8 Plus/8/7 Plus/7/SE/6s Plus/6s/6 Plus/6/5s/5c/5/4S, iPad Pro/Air 2/mini 4, iPod touch 6/5, Apple TV, iTunes, QuickTime Player, etc. •Support batch conversion, improve the video to MP4 conversion efficiency. •Take snapshot at any specific moment while previewing. •Work well with macOS High Sierra. Whether you want to convert MOV to MP4, convert MP4 to MP3, or have other video/audio conversion needs, this powerful 4Video MP4 Converter can always be your best choice. Not just converting media files, it supports any frequently-used video/audio format, offers many editing features, guarantees exactly original image/sound quality and fast converting speed. So when you have some converting missions, just give it a try. Faster MP4 to MP3 converting speed. Add more 4K UHD video formats.